Insulinoma can be managed with medication or in certain situations, with surgery. The medication that we use is called Prednisolone (Pediapred). When treating with Prednisolone, the aim is to counteract the effects of insulin and maintain stable blood glucose levels. This medication is lifelong and given twice daily orally. The dose may be adjusted by your veterinarian over time. When insulinoma surgery is performed, the aim is to remove the benign mass to prevent excess insulin secretion. This surgery may be curative although in some cases the condition may recur due to formation of new growths. It is very important to monitor ferrets with insulinoma at all times. 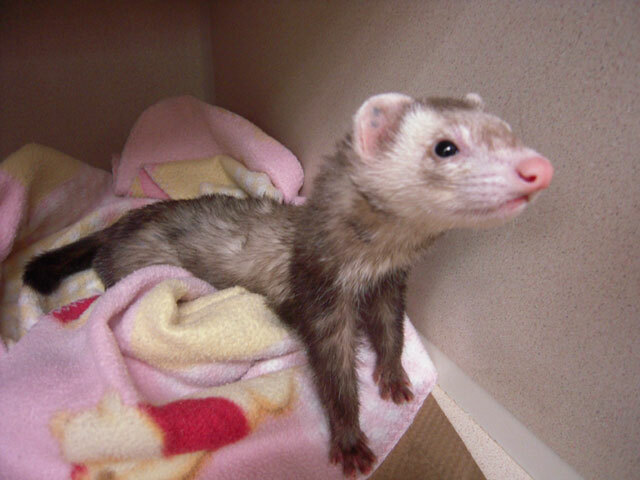 Ferrets with insulinoma have to continuously graze on food every 2-3 hours. If your ferret sleeps for prolonged hours during the day, be sure to wake your pet up to feed them. Otherwise, your ferret may suffer from hypoglycemia. Signs of hypoglycemia are drooling, weakness in back legs, trembling and in severe cases, seizures. If you notice any of these symptoms, rub a small amount of high sugar food on their gums (i.e., Nutri-Cal, honey, simple syrup, etc.) and give us a call immediately! Please call us and let us know if your pet shows symptoms of hypoglycemia while on Prednisolone. At some point, Prednisolone may stop working to raise the blood sugar and you may elect to pursue surgery. When first diagnosed with insulinoma, blood glucose should be checked once weekly until it is normal. After that stage, it needs to be checked once a month for the next 3 months and then every 3 months thereafter. You must continue to bring your pet in for bi-yearly doctor exams to monitor for disease progression. Prednisolone is given for life. 1) For an accurate result, your ferret MUST BE FASTED FOR 3 HOURS prior to your appointment. Otherwise you may choose to drop off your ferret and allow us to fast your pet before the blood test. This will incur a nominal charge. 2) Please give Prednisolone as normal on the morning of the blood test.